close to the mystical Gates of Dawn. The hotel occupies a beautifully renovated nineteenth-century mansion, which gives the place a touch of individuality. The guest rooms have different layouts as they were designed to preserve the unique architecture of the building. As it stands on one of the main Ausros Vartu Street, there are a few cosy restaurants and bars, amber shops and galleries right outside the hotel’s entrance. When reserving a room it is worth asking for one with a balcony, as some rooms have balconies right over the pretty street. Even though very centrally located, the hotel stands on a quite peaceful spot. 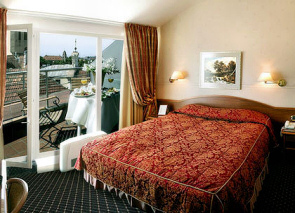 The rooms on the top floor have windows and cosy terraces offering panoramic Old Town views. They offer a choice of smoking and non-smoking rooms. All hotel rooms are air-conditioned and offer modern facilities such as complimentary Wi-Fi, hair dryer, in-room safe, mini bar, satellite TV, heated bathroom floor, iron and ironing board (upon request). Some suites have authentic 19th century ceiling décor and bathroom with Jacuzzi are some of its assets. The hotel services include laundry & dry cleaning, free parking, conference facilities; on your request they provide babysitting, fitness, SPA / beauty services to your room, airport transfer, AVIS car rental. Some services should be arranged in advance. 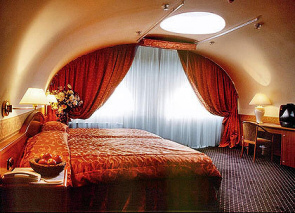 The hotel has a special Round Suite (photo above), which is very popular with newlyweds. It has an impressive round, king-size bed and framed glass walls, which offer spectacular city view. This hotel in Vilnius also has a lovely lobby bar and excellent Medininkai restaurant with a 16th century wine cellar and pretty summer courtyard, which make a perfect setting for romantic meals. I described the restaurant on our recommended Vilnius restaurants’ page as it is one of our favourites. Rooms for disabled people should be reserved in advanceChildren under 12 years old can stay free of charge in their parents’ room. Extra bed for children and crib available upon request free of charge. Pets are allowed at an extra cost. 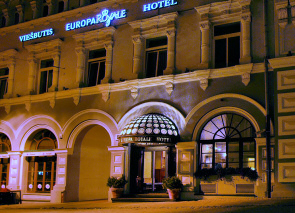 If you wish to read other people’s reviews who stayed at the Europa Royale Hotel, check out room rates and available booking dates, click on the link below.